The ELOS Touch Advance 500K 2016 exclusive hair removal device has arrived! This device utilizes the same technology and high level precision found in professional clinics today. This unique device has 500,000 Pulses, making it a workhorse lasting for years of use. Unwanted Hair can be eliminated safely and comfortably in the comfort of your own home. It is suitable for all skin tones and all hair colors. This system was developed by scientists of Syneron, the inventors of IPL and Elōs technology that combines Intense Pulsed Light (IPL) and Radio Frequency (RF) energies to deliver clinically proven , FDA cleared, permanent hair reduction and removal. Approved by the FDA The ELOS Touch Advance 500K is an innovative device for hair removal used by dermatologists worldwide. Save time and money. Why waste time traveling to expensive clinics when you can remove all unwanted hair in the comfort and safety of your own home. Within weeks the system pays for itself! Elos Touch Advance 500K is straightforward and easy to use. Using a simple gliding technique over the area you want to treat and in just ten minutes your legs will be free of hair. Within thirty-two minutes your whole body will be sleek and hairless. Use the epilator and or shaver along with the laser treatment for safe and efficient hair removal and smoother skin. With the Precision adapter, you can control the precise location and pulse of each flash instead of the lamp flashing away bigger areas. The Elos Touch not only removes hair, but reduces it, so with each use you will have less and less unwanted hair. Use on targeted areas once a week, for 7 treatments over a period of 6 weeks. Periodic touch-up treatments are suggested as needed. The ELOS Touch Advance 500K is an over the counter device intended for the removal of unwanted hair for men and women. This device will help you obtain permanent hair reduction with noticeable results within six months. Sit back, watch a good movie, or listen to music while you achieve smooth skin and permanent hair reduction in the comfort and privacy of your own home. It is recommended to use the Elos Touch Advance 500K once a week (for the first 6 weeks) and then use it as hair appears. Follow the user guide instructions so you can plan and monitor the treatments of each area. iSkinProducts offer a two year warranty, sixty day money back guarantee, and free shipping worldwide. This entry was posted in Uncategorized on December 28, 2015 by admin. 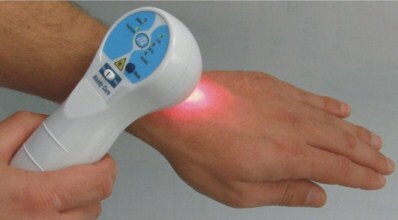 Handy Cure cold laser and magnetic field combination is relief in the palm of your hand! Are you suffering from pain and don’t want to constantly take pain killers or keep rubbing on ointment that doesn’t quite do the job? Are you looking for a compact device that you can use on the spot to treat pain? Then Handy Cure is here to help relieve your pain and discomfort. It has a wide range of applications and is the cutting edge of technology that is portable and gives on the spot treatment. It’s light weight and easy to maneuver. Pop it in your knapsack, or purse to have available while at work or while traveling. It’s portable and offers instant relief using cold laser technology that is effective anywhere at any time. combining four energy sources, each known to have a separate therapeutic effect. The combination of low-level pulse laser radiation, infrared radiation, visible red light, and static magnetic fields provides relief from chronic pain and discomfort. The handy cure is handy! The Handy Cure is designed to fit into the palm of your hand for quick and speedy recovery from pain. It operates on a rechargeable lithium battery which lasts up to eighteen hours. Treating a wide range of symptoms from migraines, back and shoulder pain, knee and joint pain and reduces inflammation. Using low-level pulse cold laser radiation, pulsating infrared radiation, visible red light, and static magnetic fields all combined in one device, it provides immediate results reducing pain and swelling which can be depilating. The handy cure has three preset settings: 1 -for chronic pain syndrome, 2 –for acute pain syndrome and 3- for treatment completion. Each setting is used for five minutes on the area that needs to be treated. This device can be used on adults and children. It’s safe and offers relief from a wide range of ailments with short five minute treatments you will find relief and satisfaction and be able to get through your day comfortably and effectively. Relieving pain can seem elusive; with all the salves and cure-alls on the market it can be frustrating deciding what to do and what is actually the most effective. Many people resort to taking heavy duty drugs in order to cope with their pain, but they are not always the most effective way to treat reoccurring pain because they can alter your daily activities and deplete you of energy. So, although it’s tempting to pop a pill to feel better it’s important to know different alternatives and methods for relief. There are many alternative herbs and over the counter salves on the market that do help and give relief, but not deep relief. When your muscle is aching whether it be from an injury or just sitting too long at work in front of the computer screen and immediate relief is needed Handy Cure offers pain relief even from migraines. It’s easy to use and Improves blood microcirculation while reducing inflammation. This handy device combines low-level pulse cold laser radiation, pulsating infrared radiation, visible red light, and static magnetic fields all in one device, providing healing pain relief. Handy Cure is small and portable and easy to use at the office or at home. B-CURE Low Level Laser Treatment is another alternative for relieving pain at home or in the office. Pain resulting from Injuries, Rheumatic and chronic joint inflammation are just a few areas this device treats to alleviate pain. It can even help eliminate Postpartum Stretch Marks. This handy device uses clinical strength soft laser power in a light, portable, rechargeable and is user friendly. Whip this convenient and easy to use device out and treat pain on the spot. Is your lower back giving you problems? Too many hours sitting in a chair trying to work but throbbing in your lower back is unbearable and making it hard to concentrate and be productive? MD cure, an extraordinary device used at home or in the office relieves Lower back pain using pulsed electromagnetic field technology. MDcure is a new patent-pending technology that generates an electromagnetic field at low frequencies, creating a massaging effect that relaxes back muscles, relieves spasms and increases lumbar mobility and range of motion. It can be used conveniently over clothes while working or relaxing at home. Choose the device that best suit your needs on iSkinProducts to relief pain and help the healing process begin. This entry was posted in Uncategorized on June 23, 2014 by admin. This handy and effective shaver and epilator has arrived in time for a smooth summer. Get rid of those unwanted hairs once and for all. The Me device has 200,000 built in flash cartridges, supplying years of full body hair removal. The Me My ELOS 200K 2014 version is the most advanced device available for at home permanent hair reduction on the market today. It’s safe and painless for all hair colors and is effective on all skin tones including dark skin (type 5) and for very fair skin types. Use the epilator and or shaver along with the laser treatment for smooth hairless legs in only ten minutes or treat your whole body in only thirty two minutes. With it’s easy to use gliding technique and three different settings that can be adjusted according to your comfort level you can treat large areas at a time effectively and professionally at home. The Elōs is the most advanced technology available developed by scientists at Syneron who invented IPL professional technology. The Elōs is the only at home device to combine Intense Pulsed Light (IPL) and Radio Frequency (RF) energies to deliver clinically proven, permanent hair reduction. The combination of these two complimentary energies is safe and effective for smooth, hair-free, beautiful skin. Mē is the only device that combines elōs technology which slows down hair development while providing safe hair removal. A 200,000 built in Quartz lamp cartridge that can last for years of home use treatments. Glide mē over the selected treatment area. Use mē once a week for six weeks. After that if hair starts to grow back periodic touch up treatments are needed. For light hair (blond, dark blond and red hair) it is recommended to use the epilator. Repeated follow up treatments vary from person to person. Over time the growth will be reduced and the periodic touch up treatments will be further and further apart.